You can target 1 Dragon monster you control; it gains ATK/DEF equal to the total Link Rating of the Link Monsters currently on the field x 100, until the end of the opponent's turn. 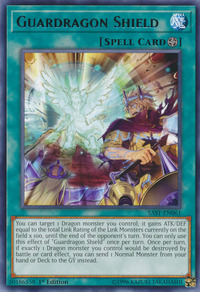 You can only use this effect of "Guardragon Shield" once per turn. Once per turn, if exactly 1 Dragon monster you control would be destroyed by battle or card effect, you can send 1 Normal Monster from your hand or Deck to the GY instead. Crusadia Spatha, Crusadia Draco, Crusadia Maximus and Orcust Brass Bombard (offscreen, the monster Maximus is fighting against) appeared in this card's artwork.